This weekend, I was quite pleased to see that Dark-eyed Juncos have returned to my yard. They seems pretty pleased to be on the property themselves! Corey’s Best Bird of the Weekend was actually a whole flock of birds. 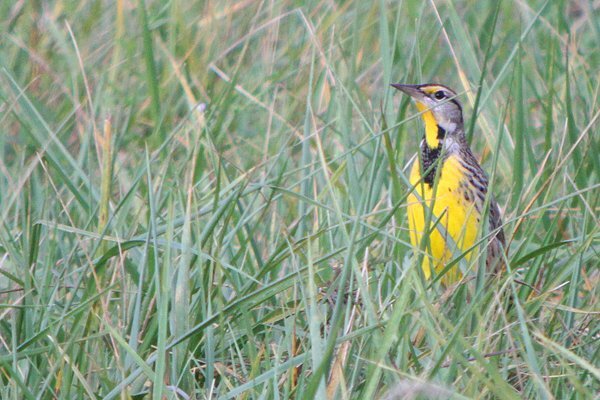 He was pleased to find at least 24 Eastern Meadowlarks taking advantage of the great habitat atop the (capped) Edgemere Landfill in the Rockaways in Queens. Well, I saw a sparrowhawk on the way to work yesterday morning. I then spent around 12 hours inside, where the only birds to be seen were in the form of foie gras and rilletes…but hey, sparrowhawk! Best heard bird for me was Great Green Macaw near Virgen del Socorro, Costa Rica. Best seen bird was a male Black-crested Coquette that was having a dispute with a Green Thorntail also near Virgen del Socorro. Sharp-tailed Sandpiper outside of Boise. 3rd record for Idaho! I was able to digiscope some decent photos with the Swarovski ATX 85mm, I blogged about it here. Lifer #305 in the form of a Gull-billed Tern. It has been a few years since I’ve seen them in my yard, but a Red-breasted Nuthatch is hanging around, sometimes with the Carolina Chickadees. And I also saw a Meadowlark, don’t know if it was Eastern or Western. The return of the “lost” Semipalmated Plover to Broome-on schedule! We presume that once you migrate in the wrong direction once you will continue to migrate that way! Good to see it back-same place as other years! I’ve been home sick, and was really happy to see our resident Anna’s Hummingbird hover right outside my window, two feet from my face. And good luck to Easterners finding interesting birds in the Sandy fallout. We’re getting big winds here, which may make life dicey for migrants over the next few days. Friday is close enough to being the weekend, isn’t it? I went to Rhode Island to see the Wood Sandpiper before returning home to find that we were about to be hit by the chaos known as Sandy.